I was reviewing some of my daughter's school work when I came across one of her Social Studies Test (you can view the exact test here). The test contains different "documents". These documents consist of one or two sentences. The student must answer questions regarding the information in the document. This test was about child labor and how the union and government rescued children from the dangers of factory work. I've recreated the contents of the test in my post below. Below, in blue, are my answers to the test questions. Directions: The task below is based on documents 1 through 7. This task is designed to test your ability to work with historical documents. Look at each document and answer the question or questions after each document. Use your answers to the questions to help you write your essay. During the late 1800s and early 1900s, many children were hired to work in factory sweatshops. Often they worked under very dangerous conditions. Directions: Read each document and answer the question or questions that follow each document in the space provided. Gus Misuinas and Catherine Hutt worked at a factory in Philadelphia.
. . . In 1902, 12-year-old Catherine Hutt went to work at a knitting mill. Her working hours were “from 6:30 in the morning until six at night” — even longer than Gus’s. At age 14, Catherine switched to working in a paper mill. “All I did,” she said years later, describing her job, “was fold the ends of each roll as they came out.” How did she enjoy the work? About as much as Gus enjoyed his job: “I hated it.”. . .
1) Today, most people work about eight hours a day. Compared to today, what conclusion can be made about the length of Catherine’s workday? Why we would compare the average workday of many people today to one person's workday in the past? This is an apples-to-oranges comparison.
. . . Boys began working as doffers when they were seven or younger. It was their job to remove the whirling bobbins when they were filled with thread and replace them with empty ones. Many of the youngsters worked barefoot. That made it easier to climb onto the huge machines so they could reach the bobbins or broken threads. If they weren’t careful, they could fall into the moving machinery or be caught by it. The accident rate for children working in the mills was twice as high as it was for adults. . . .
2a) According to this document, what could happen to children while they worked on these machines? They would get paid, which allowed them to assist in providing food and shelter for themselves and their families. 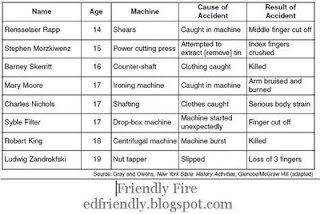 2b) According to this document, why were accidents common in many factories? During this era there were children who worked on farms where there were also severe, and sometimes fatal, accidents. Why would parents have their children work in dangerous factories instead of farms? What was the accident rate on farms? Is it possible factory work was actually safer? 3) Using the information in this chart, write one general statement about the working conditions of children in the late 1800s. Most of the people on the chart were in their late teens. There is a good chance these people were considered adults during this era.
. . . Children toiled in cotton mills as spinners, doffers, and sweepers. Girls were employed as spinners. They walked up and down long aisles, brushing lint from the machines and watching the whirling spools or bobbins for breaks in the cotton thread. When a break occurred, they had to mend it quickly by tying the ends together. A spinner tended six or eight “sides,” as the long rows of spindles were called. She had to be on her feet nearly all the time, working eleven or twelve hours a day, six days a week. . . .
. . . The machinery made such a racket, workers had to shout to be heard above the din [noise]. And because heat and moisture helped keep the cotton threads from breaking, the mill windows were always kept closed. The hot, steamy air was filled with dust and lint that covered the workers’ clothes and made it hard to breathe. Mill workers frequently developed tuberculosis, chronic bronchitis, and other respiratory diseases. A boy working in a cotton mill was only half as likely to reach twenty years of age as a boy outside the mill. Girls had even less chance. . .
. . . Glass making was another industry that employed thousands of boys in tough and dangerous jobs. Most of these youngsters worked as blowers’ assistants in glassworks furnace rooms. The intense heat and glaring light of the open furnaces, where the glass was kept in a molten state, could cause eye trouble, lung ailments, heat exhaustion, and a long list of other medical problems. The temperature of molten glass is 3,133 degrees Fahrenheit. The temperature in the glass factories ranged between 100 and 130 degrees. Fumes and dust hung in the air. Broken glass littered the floors. 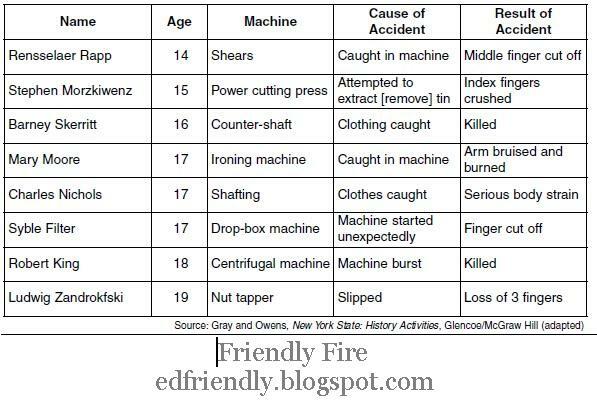 It wasn’t surprising that cuts and burns were the most common injuries. . . .
4) Give two examples of dangerous working conditions described in this document. There were some treacherous working conditions. I feel bad for kids who were forced to work in these factories. Oops...wait...who was forcing them? Was the factory owner dragging kids into the factory and forcing them to work? American Federation of Labor’s seal for the eight-hour workday. Samuel Gompers, a union leader, organized national unions and local labor councils designed to educate the public on working-class issues. They also prepared labor legislation and persuaded the United States Congress to act on it. From 1881 to 1886, Gompers worked for laws that required school attendance, made children go to school, and regulated child labor and the eight-hour day. 5) What were two things that Samuel Gompers wanted the United States Congress to do? Notice the portrayal of the union and government coming to the rescue of the children. It's as if there are no other adults in existence. Children are raising themselves and being dragged into factories to work against their will. Gompers believed that government regulators would make better parents than the children's actual parents. And, of course, Gompers petitioned for forced schooling since he knew what was best for all the children in America regardless of the parents' intentions or wishes. “Mother” Mary Jones gave lectures on the conditions and hazards of child labor. She also organized and encouraged children and adults to strike. 6a) According to this picture, what are the children asking for? If these children want to go to school then they should stop working and go to school. Who was forcing them to go to work? Their parents? If so, maybe their parents thought work was more beneficial to the child and family. 6b) List two ways Mary Jones tried to improve working conditions for children. The New York State legislature passed a law in 1874 stating that all school age children must attend school at least fourteen weeks per year. 7) How did the Compulsory Education Law of 1874 improve the lives of child workers? Is the reader to assume that going to school 14 weeks per year somehow improves the lives of children? In what way? Economically? Educationally? Does it improve the lives of all children? Is the reader not allowed to consider that mandatory schooling may actually be detrimental to the lives of some children? My brother's life improved dramatically once he was freed from compulsory government education. He loves machining and working with his hands to create things. Government schooling was a useless exercise for him. I'm sure he's not the only one. Directions: In your own words, write a well-organized essay using the documents, the answers to the questions in Part A, and your knowledge of social studies. Parents are not mentioned once during this entire document. It's as if they were nonexistent during this period. The unions and government are portrayed as being the only ones concerned about the welfare of children. My wife and I know there is no other person as concerned with the welfare of our children as ourselves. I find myself continually reeducating my government schooled daughter. I may soon grow weary enough of this continual reeducation that I may rescue her from this institution deprived of thought and teach her myself. Regardless of where she is educated there is one thing I want to teach her and the rest of my children: THINK.